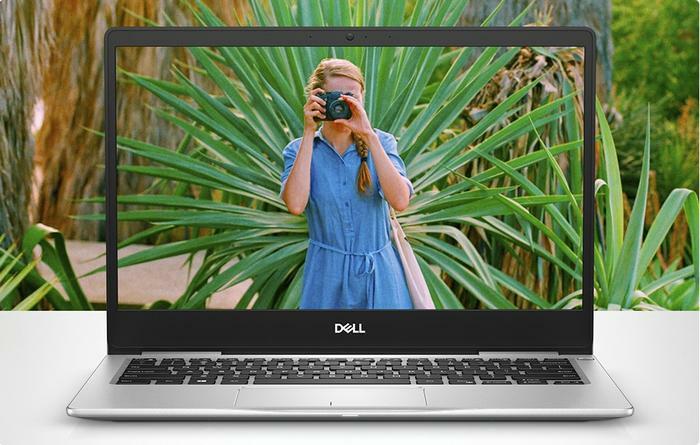 After effectively stealing the crown for powerful, portable and professional notebooks, Dell are now beginning to let the hardware features that made the XPS 13 so great trickle down to the rest of their product portfolio. Launched late last year, the new Inspiron 13 7000 2-in-1 promises to tie together the same winning formula of longer battery life and quieter performance with a 13.3-inch FHD IPS touch display, active pen support and the considerable grunt of Intel’s new 8th Generation Core processors. In terms of design language, the Dell Inspiron 13 7000 shares a lot with the company’s flagship XPS 13 - albeit in a more flexible form. The Inspiron 13 features a 360-degree hinge, allowing you to use like a traditional clamshell, modern tablet, or anything between the two, really. Unfortunately, the flip-side of this flexibility is that the 2-in-1 sometimes comes across as a bit more bulky than maybe it ought to be. At 1.45kg, it’s not necessarily the heaviest laptop out there - but it feels comparatively heavy for one with a 13.3-inch display. The keyboard is also another weakness. The key switches themselves feel very mushy and - over longer periods of usage - don’t deliver the same kind of tactile responsiveness you can easily find elsewhere. Still, on the whole, the Dell Inspiron 13 does feel like just another one of the sleek, silver, modern-looking laptops that the company and other legacy OEMs are most well-known for. It’s a little generic - but some users are more than happy to live with those occasionally mundane looks in exchange for promise of higher performance. Thankfully, when it comes to everyday performance, the Inspiron 13 7000 did an admirable job. It juggled files, windows, web browsers and more with clean efficiency - rarely leaving us wanting or waiting. Then, on benchmarks, the Inspiron 13 7000 proved itself a surprising standout. Assuming you opt for the highest-spec'd (and most expensive) variant available, it’s got the guts to go toe-to-toe with not only Dell’s brilliant XPS 13 but also the best ASUS and Acer have to offer. A lot of this is down the 8th gen Intel Core processor powering the 2-in-1, but it's impressive regardless. In Cinebench’s OpenGL test, the Inspiron 13 scored an average of 52.52fps. Meanwhile, Cinebench’s CPU test saw it rate 547cb. When subjected to the Battery Eater testing tool, the Dell Inspiron 13 7000 took 1 hour and 14 minutes to dissipate its entire charge. This test is designed to burn the battery down as fast as possible and show off the minimum amount of battery life you can expect. Since everyone’s ordinary usage patterns - and the impact that those patterns will have on your battery life - are going to naturally vary, this is generally a good way to gauge how the battery on one notebook compares to another but won’t necessarily reflect your exact everyday experience with the machine. Those reservations aside, this still isn’t an especially strong result. 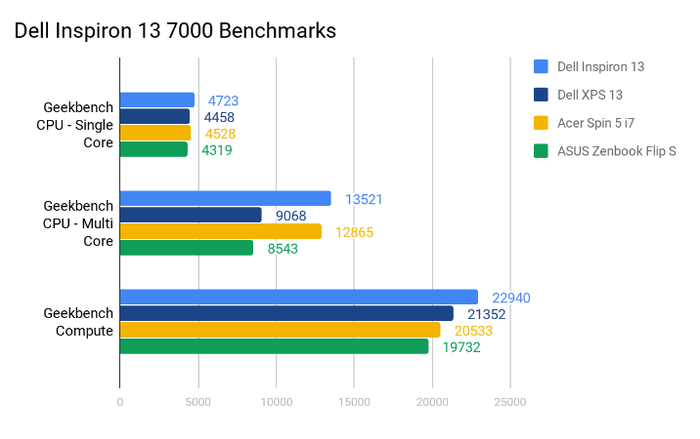 From what we can tell, the higher-end performance being milked out of the Inspiron 13’s 8th-gen Intel Core processor does seem to come at a cost here. It's not the worst battery life we've seen in a 2-in-1 but it's far from the best on this front. As someone who spent a bit of time messing with both devices, I feel like I’d personally opt for the XPS 13 over the Inspiron 13 7000. That said, that's probably largely down to personal preference. If the extra flexibility that a 2-in-1 form-factor can offer and support for Dell’s Active Pen stylus was something I was in need of, the Inspiron 13 7000 feels like a natural port of call. There’s a sturdiness to the form-factor and a height to the performance you can get out of the Inspiron 13 that’s easy to like and easier still to live with.